Periodic Coffee Table, I thought this was simply ingenious. In a commanding first place with 41% of the votes we have the cell phone jammer, looks like it’s not just us who don’t like listening to other people on the phone. 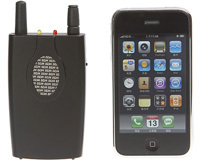 I hate being stuck on a train when some idiot is yelling down a phone (for some reason callers need to shout when in confined public spaces), this nifty gadget fixes that, the Portable Cell Phone Jammer. Now if only they’d make one to work with MP3 players. In joint second place with 71 votes apiece we have the M400 Skycar and ColorRight. In third place (well maybe fourth as second was tied) we have the cool periodic table. Check out this geeky coffee table, the Periodic Coffee Table, this bound to get some attention, when your friends come round for a coffee. The Periodic Coffee table measures 4 ft x 2.5 ft x 16 inches, and if features all the 92 natural elements as well as all of the man made elements actually built in to the table. Thanks again to all entrants, voters and commentators. The next weekly coolest gadgets will be up for voting this Friday (write about gadgets and want to enter, here’s how), see you there. This weeks randomly drawn voter who wins the $50 Amazon voucher is Drew, congratulations Drew we’ll be in touch. Even though ColorRight was in second place it had a very suspicious voting and commenting pattern, we’ve spoken to the submitter, PhotographyBay, and believe they had nothing to do with the suspicious voting so they have been left in second place. This is a fun contest and we’d like to keep it that way but please play fair.